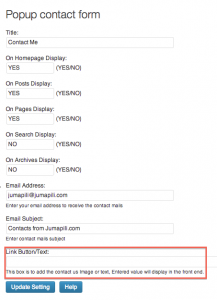 Would your rather have a popup menu link and page for your “Contact Me” in your menu. Well, here is a pretty cool way to to accomplish that task. You will need 2 plugins an optional 3rd. 1. 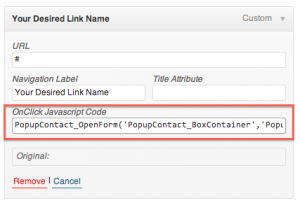 Under Settings > Popup contact form – Configure the plugin as you desire but be sure to remove the image link form “Link Button/Text” If you don’t this then the button will show up at the of all your pages, and we don’t need that to happen. 1. Open Appearance > Menus and be sure to select the menu you want to add the popup to. 2. 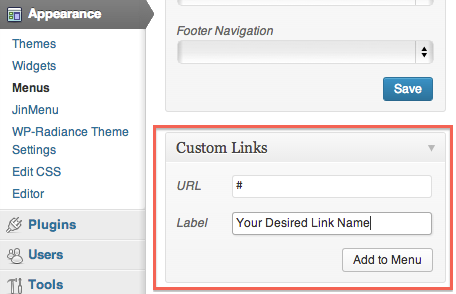 In “Custom Links” configure as shown below “Contact Me” or “Contact Us” whatever your desired link name is. 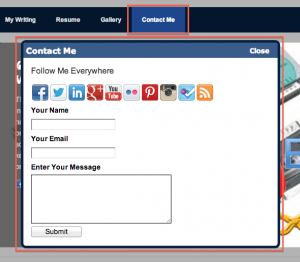 ***Popup Contact Form doesn’t come exactly with that look I did some styling. You can also!